Personnel - Jeremiah McDade: tenor saxophone; Donny Kennedy: alto saxophone; Paul Shrofel: piano; Solon McDade: bass; Rich Irwin: drums. 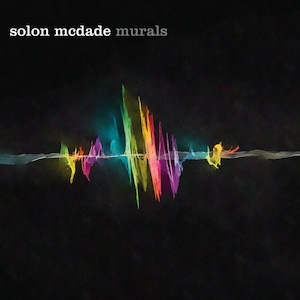 Juno award-winning bassist/composer Solon McDade releases his debut album in the company of his brother Jeremiah McDade on tenor saxophone, Donny Kennedy on alto sax, Paul Shrofel on piano, and Rich Irwin on drums. Comprising nine original tracks, predominantly faithful to the 4/4 time signature, Murals shows the quintet swinging aplomb in several tunes, letting the old school routines invade with anticipated if colorful intonations. Elated experiences evocative of the hard-bop era such as “Whatever Whatever”, and “Off The Bed Rose” thrive through audacious voice leadings while the opener “He’s A Problem In the Locker Room” blurs the line between hard-bop and post-bop, embracing the moods of Wayne Shorter and Cannonball Adderley and displaying a fine collective improvisation by the pair of saxophonists. In those pieces, we can hear Irwin complementing passages with earnest drum fills or trading bars with the bandmates. While “Blues For Sebastian” brings the horn riffing tics of the 60s, “Ali’s Second Line” adds some funk, soul, and a bit more rhythmic seasoning, diverging from the post-bop orientation of “Buy The Tractor”, introduced by the bandleader’s woody bass and rounded off with expressive reeds for a relaxed dance. The arrival of piano and drums fixates the cadence before the stipulation of the theme through a melodic statement uttered in parallel. The enthusiasm for swing refrains with songs like “Do Airplanes Scratch the Sky?”, a modal hymn with balladic scents that still tilts for a while, and “The Ballad of Sir William Ormerod”, a 3/4 piece initiated with Shrofel’s rubato piano and later propelled by brushed drums. Closing out the album at a medium tempo, “A Shorter Thing” occasionally suggests Wayne Shorter’s mood but confining it to a curvilinear romanticism. Although technically well executed, I found the music obeying recurrent forms and formulas throughout. The impact would be larger if the quintet had assumed a more risk-taking posture, perhaps adding more collective improvisations and interactive passages instead of the traditional structure theme-improv-theme. 01 - He’s A Problem In the Locker Room ► 02 - Buy The Tractor ► 03 - Do Airplanes Scratch the Sky?